I love everything about this pattern! 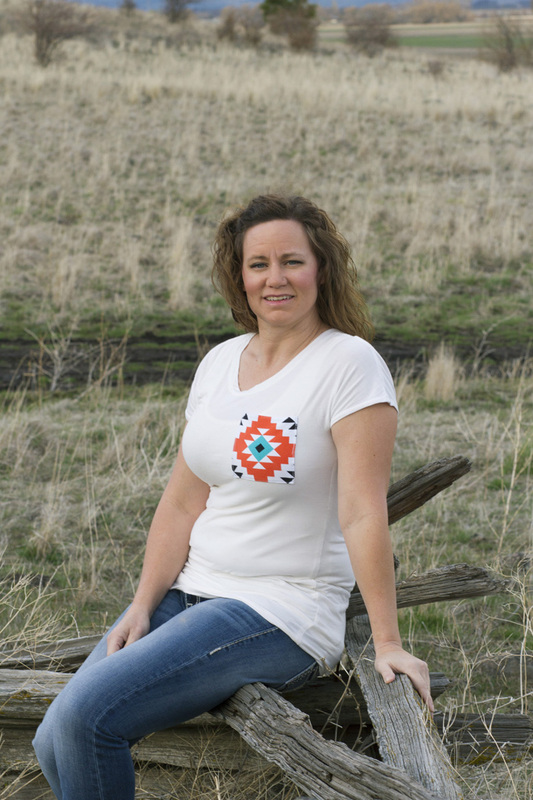 I was part of the testing group for the new Sun Kissed Tee from Peek-A-Boo Pattern Shop. 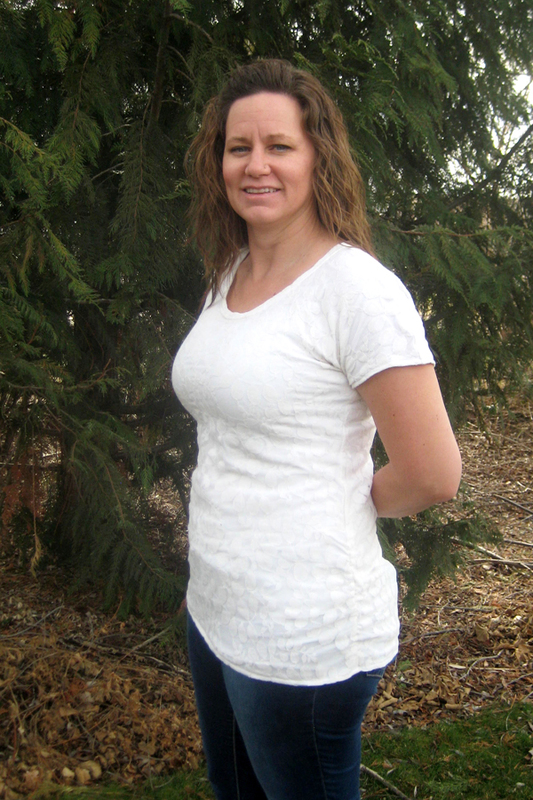 The Tee has two hem finish options – standard and a longer ruched, and there is also a Maternity Add-On Pack Available. I tested the women’s size large ruched hem version, and I did not have to make any adjustments to the pattern at all. The pattern is drafted for the standard 5’5″ and I am 5’9, and the shirt is plenty long enough. If, however you need to lengthen or shorten it, there are cut lines on the pattern to do so. I made the large based on my measurements (I have a very large chest) and that knit fabric tends to be a bit more fitted; however, I feel like I could have made a medium, and it would have worked just fine, especially with extra-stretchy fabric. I do like my clothes to be fitted, but not tight. I absolutely love this shirt! I made several versions, one of which was a lace overlay, and I feel like I could easily wear it with a pair of slacks and it would look completely appropriate. It is versatile, comfortable, and very easy to make! In addition, I made two color block versions for my 17-year-old daughter, Harley, and she loves them! She chose to have the longer-hemmed ruched tee without the ruching. The Sun Kissed Tee is probably the easiest thing I have ever sewn. Seriously. It’s three pattern pieces, two seams, three hems, and a neck band. You can print the pattern, tape it together, and have a completed tee (or two) in an evening! I was able to cut the entire shirt from one yard of fabric! I should mention – I am new to sewing knits, and I had never before sewn ruching, and this is the perfect beginning knit project, and it is a great way to learn ruching! Head over to Peek-A-Boo Pattern Shop to get your own Women’s Sun Kissed Tee, you will not regret it, I promise! If you need, grab the Maternity Add-On Pack, as well! I have been wanting to start making garments, and find a great t-shirt pattern in particular. I found a great serger at the thrift store last year, but have just found knits to be incredibly intimidating. Your review is fantastic and it sounds like this might just be the pattern for me to stop being a nervous nellie about the whole thing. May I ask where you found your knits from? The only fabric store nearby is a Hobby Lobby, and I’m always unsure if knits from there will work out right. Beautiful shirts! Well done!! Also, thanks for stopping by the blog and linking up today! I really appreciate it! I was terrified of sewing knits, but then Todd bought a huge stash of fabric that included a ton of knits from our local classifieds so I forced myself to try it. I have bought some knit at the local Wal-Mart, but the quality is junk and it didn’t last well. The knits I love the most are from Peek-A-Boo Fabric Shop (same as the pattern – it’s linked in the post), and they are reasonably priced. I know some people buy from Girl Charlee, but I haven’t yet. 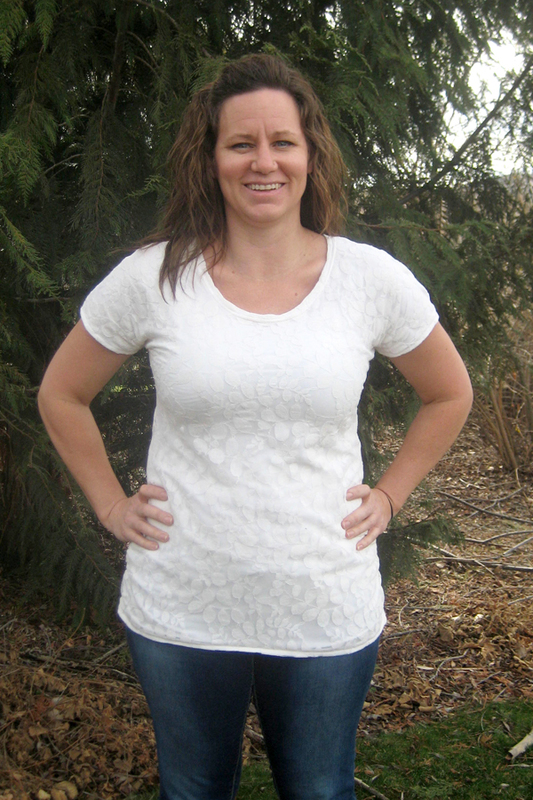 All the knits I used for this shirt (except the cream with lace overlay) were from Peek-A-Boo. 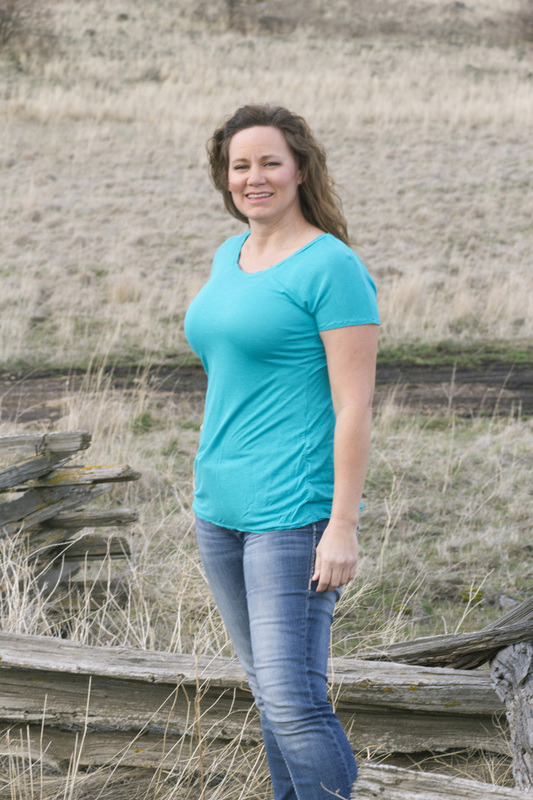 Take the plunge, it really is the easiest shirt I’ve ever made! Your shirts all turned out adorable! Last summer I made a t-shirt, bought the fabric from Joann’s. It fit great. When I washed it, it came out a crop-top! I didn’t know knits could shrink so much! Where do you buy your fabrics? Do you pre-wash? oops. Just ready your comment above mine, and got my answer! Thanks! Thank you! I do pre-wash everything. The turquoise fabric was from Wal-Mart, and it did not wash well after the shirt was made even though I pre-washed it. The ivory knit with lace overlay was from my stash, and Todd bought them for me, so I have no idea where they originated from. All the other fabric I bought from Peek-A-Boo Fabric Shop, and it has washed wonderfully!